Heat oven to 350°F. Grease 13x9-inch (3-quart) baking dish with shortening or cooking spray. In 12-inch skillet, melt butter over medium-high heat. 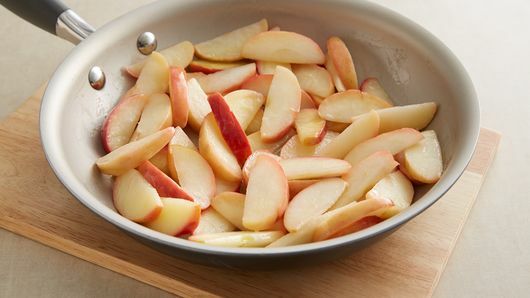 Add apples; cook 10 to 12 minutes, stirring frequently, until softened and beginning to brown. Remove from heat. Meanwhile, in large microwavable bowl, microwave cream cheese and powdered sugar uncovered on High 1 minute, stirring every 30 seconds, until softened. Stir until smooth, then slowly stir in milk. 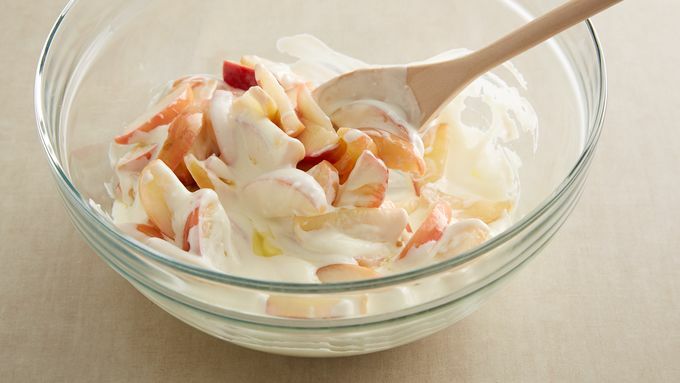 Stir in apple mixture. Separate dough into 5 rolls; return icing to refrigerator. Cut each cinnamon roll into 6 pieces, and stir into apple mixture. Pour into baking dish. Bake 26 to 32 minutes or until bubbling around edges and dough is baked through. Let stand 10 minutes. Transfer icing to quart-sized resealable food-storage plastic bag. Cut 1 corner with kitchen scissors, and drizzle over mixture. You'll need about 6 cups of sliced apples for this recipe. If your apples are large, you'll probably need 4 or 5 apples. No need to peel the apples for this baked beauty--besides cutting down on prep time and adding nutritional value, the peel also gives the dish structure. Dessert for breakfast or breakfast for dessert? 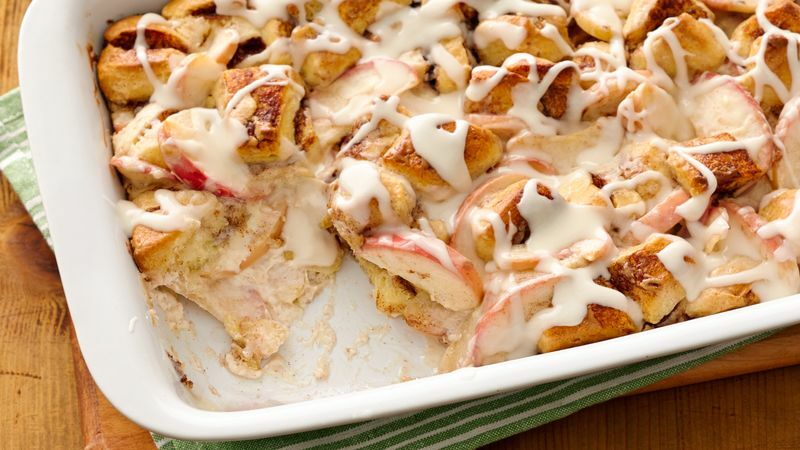 When it comes to this cinnamon roll apple bake recipe, we say, both! 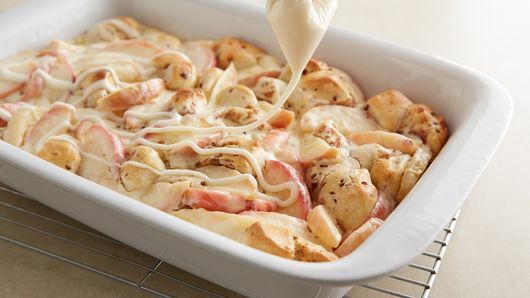 This indulgent breakfast casserole is packed with apples, cream cheese, cinnamon rolls and just a few more ingredients. You don’t even have to peel the apples, so prep is a snap! Not sure which apples are the best choice for this recipe? We recommend Granny Smith, Honeycrisp or Braeburn. If you love this recipe, then that means you probably love apple pie. Make your best pie ever by reading our handy how to make apple pie article, which is packed with helpful kitchen-tested tips and tricks. 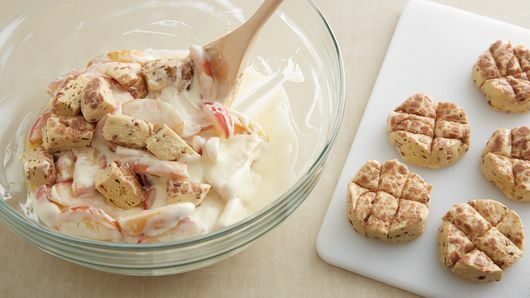 Make sure you stick around and explore all of our amazing apple recipes!